Undoubtedly, Riptide GP2 can be claimed as one of the best Android racing games this year . 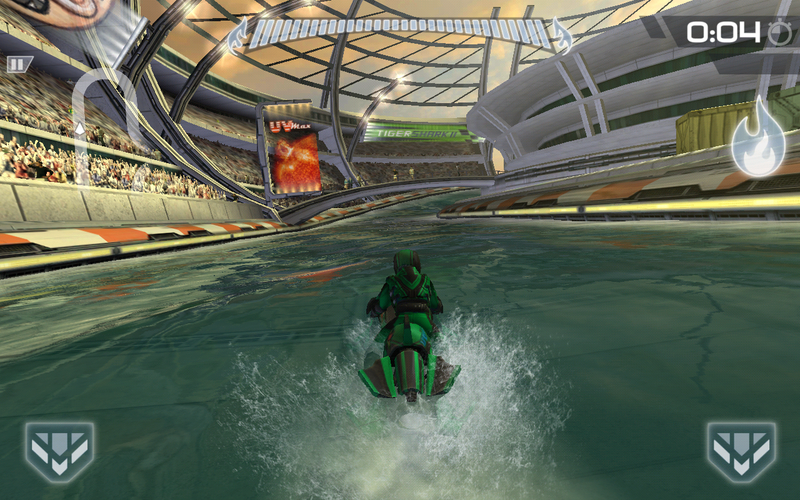 Riptide GP2 is kind of a jet-skiing game , The events take over canals and rivers placed in a futuristic location . The original game was a let down and as you play this game you will feel how far the game has improved . RIptide GP2 is based on an entirely new game engine . The level of detail in the game is incredible real and the graphics are silky smooth . The wave dynamics and physics look and give a absolutely real feeling . The developers claim the game is optimized for Quad core devices . Though players can reduce the graphics details inside the game settings to get a better experience . 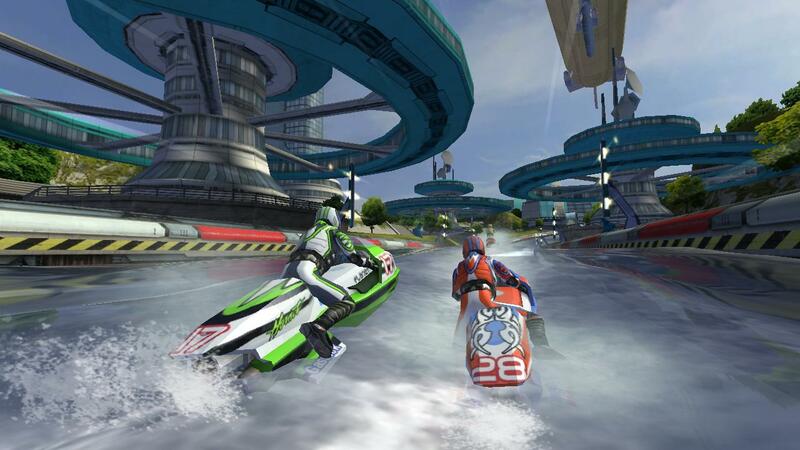 Riptide GP2 is excellently designed and the developers have made sure that players get really hooked into the game . The gameplay provides a really immersive experience . As you race through the game , the game gets challenging . You get to experience points (XP) and money for completing each race , which you can spend on upgrading your watercraft or unlock new ones . Unless you upgrade your watercraft , getting into the first place is not going to happen . The AI in Riptide GP2 is really good and the CPU players give an intense competition . There are 8 cups to win in the game , each cup has various events with different map and modes . Apart from normal race events there are two other modes , which are Elimination and Hot lap modes . In Elimination matches , the game eliminates the last player in the race every 15 seconds and In Hot lap you race single and you have to complete the laps in the best possible time . If you get bored of these , Then there is the new multiplayer mode in Riptide GP2 that allows players to challenge their friends online . Racing though water canals and rivers is an absolutely great experience . As you race through the tracks , you find ramps , which allow players to perform stunts on their jet-ski as they jump in the air . You get awarded with points for every stunt which varies according to the difficulty of the stunts and also you build up boost . These boosts are very vital and can make a difference between your winning and losing . The stunts are to be executed at a correct time before you take off into the air , a few seconds delay in executing the stunts can lead to a crash . As you level up inside the game , you get Skill points and money , using the skill points you can unlock new stunts . The game has plenty of unlockable stunts , every stunt has a different combination and as the combinations get complicated , you get awarded more skill points with every stunt . Riptide GP2 follows more of a non-violent approach .The game does not allows players to knock out the other racers . But instead The game makes sure that nobody gets to stay ahead all the time . your positions keep on changing and you have to worry about getting first in the race , not how to knock down your opponents . Apart from the career mode Riptide GP2 has a multiplayer mode too . The multiplayer allows upto 4 players to compete against each other . You need to sign into your Google+ account for this and the game makes use of the latest Google Play Games to connect with your friends . Overall Riptide GP2 manages to provide a great racing experience . The developers have took looked upon to rectify every aspect of their original Riptide’s issues . The graphics , stunts and the exhilarating experience of racing upon tides makes the Riptide GP2 worth buying . If you like this Riptide GP2 gameplay review then do share it with your friends . Next on the list we will be reviewing Prince of persia : The Shadow and The Flame .